Most homeowners policies exclude coverage for floods. That’s why it’s important to consider purchasing separate residential flood insurance. 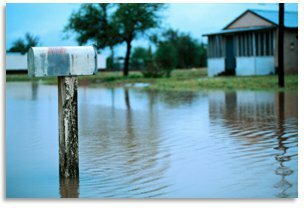 Floods can result from events such as a storm, heavy rains, or a spring thaw, and can cause a lot of damage and expense. With climate change, the prospect for future floods may be increased. The National Flood Insurance Program (NFIP) offers flood insurance through private insurers, including some of the insurers we represent. The rates are set by the NFIP and do not vary from one company to another. Coverage can be purchased for buildings in an amount up to $250,000. Contents coverage must be purchased separately; up to $100,000 in contents coverage is available. The NFIP recommends purchasing both coverages. This coverage is frequently required by mortgage holders for properties located in areas that are at higher risk. Typically, there is a 30 day waiting period between when a new flood policy is purchased and when coverage goes into effect. Flood insurance, especially if you live in a low to moderate risk zone, can be quite affordable. Please contact us for more information about this important coverage.